Did you ever wonder what your emotions actually look like? 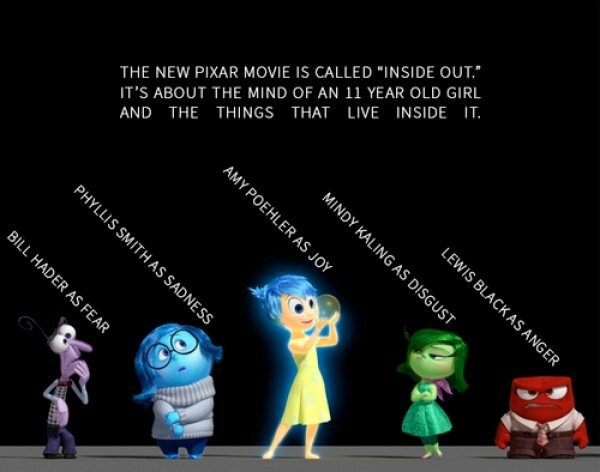 Leave it to the animation geniuses at Pixar to put a visual on such human feelings as joy, anger, sadness, disgust and fear for their upcoming comedy Inside Out. The studio shared an anticipated trailer for next summer’s movie. We have it for you above. The clip cleverly connects Inside Out -- which they are describing as "A Major Emotion Picture" – to the rich, emotional history of past Pixar movies. And yes, when we see all of the examples of the different emotions in movies like Toy Story, Monsters Inc., Up, Finding Nemo and Cars, it does appear like Inside Out is the movie that Pixar has been preparing to make for decades. Amy Poehler of Parks and Rec and Saturday Night Live lends her voice to Joy, the apparent leader of the various emotions of Riley – a young girl who has her world turned upside down when her family moves to San Francisco because her father starts a new job. From what we have heard about Inside Out, Riley’s emotions "live" in an area known as Headquarters. And Headquarters is rocked to its core by all of the emotions triggered by Riley’s move. Hey, she’s a kid. Emotions fluctuate like a kite in a hurricane. Deal with it… in an animated fashion. Poehler will be joined in Inside Out by the voices of Lewis Black, Mindy Kaling, Phyllis Smith and Bill Hader. The movie will be directed by Pete Docter, a longtime Pixar veteran whose previous credits include Monsters Inc. and Up. So if you can recall that breathtakingly sad opening montage from Up, you can prepare for all of the emotions that likely will flood your way when Inside Out finally reaches theaters. Press play below. Make sure you have tissues nearby. Inside Out opens in theaters on June 19, 2015. That means it will go head-to-head against Fox’s Paper Towns, with Nat Wolff. Yeah, my money is on Pixar in that slot.